Nothing more terrible then waiting in a long custom entry line after a 12 hour flight. While there are a lot of hacks to make your life as a frequent flier better, nothing beats reducing your travel time. 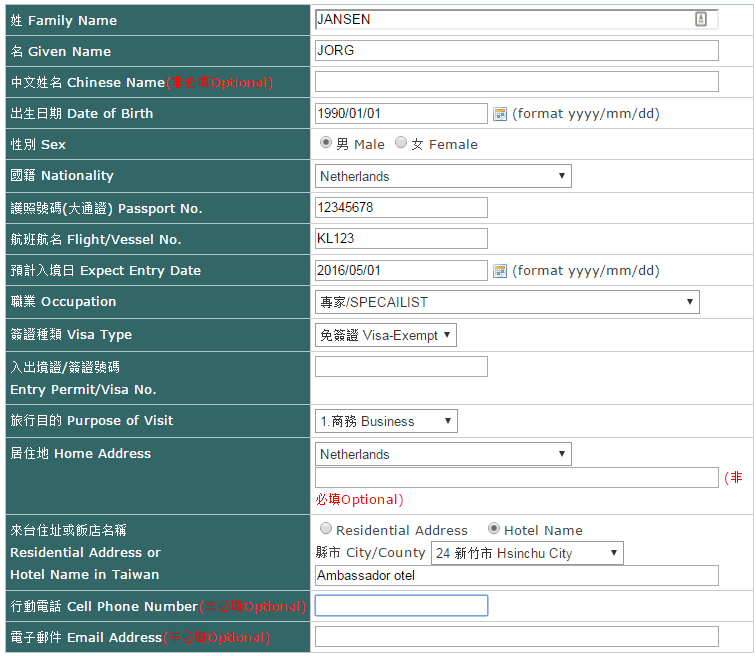 Two hacks to make things faster for entering Taiwan in this post: online arrival card and speedy immigration! First of all, forget about that terrible little paper you get in the airplane to fill in all your details that you need to handover to the customs officer. Since July 2015 you can actually do this online. I’ve done it now for over 4 times and 2 out of 4 times I still had to explain the customs officer that I filled it in online. Just pointing at the card on the desk and saying internet is all that it took. This way you only have to hand over your passport and leave your fingerprints. Works for every Taiwan airport and port. Attached an example how to fill it in. Keep in mind that I’m Dutch and that the Netherlands is on the visa-exempt country list. Always check if you need a visa to enter. Keep in mind that after submitting you don’t need to print it. They have it now in their database, so just giving your passport should do the trick. Here the link to the Online Arrival Card form. My favorite! 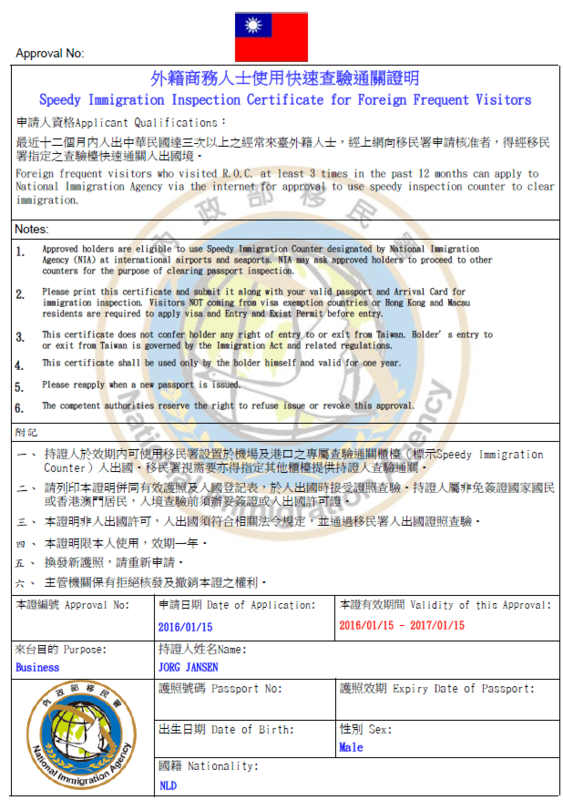 If you entered Taiwan a minimum of 3 times in the last 12 months you can apply for the speedy immigration certificate. You fill in an online form with details of your past visits and submit it. After that you can download a certificate which is valid for 1 year. Last time I arrived at Taoyuan airport and there was a massive queue. In the past I’ve stood in half a length of what I just saw and it then took already 1 hour 15 min to get at the custom officer desk. Thankfully the colleague I was with needed to go to another city, so while she queued the looooong line, I proudly took my certificate in my hand and entered an empty speedy immigration counter. Here is the link to the online Speedy Immigration form. Always carefully read the rules attached to the certificate and if you can apply.